Second floor - stairs or elevator access. 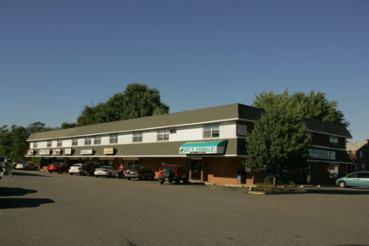 Also located in our shopping center: Family Dollar; Franklin Mint Credit Union; Art's Animals; PA Wines & Spirits Store. From I-95: Take Interstate 95 northbound or southbound to the Route 420 - Prospect Park exit. Continue 2 miles on Route 420 (through the Borough of Prospect Park) to the traffic light at MacDade Boulevard (Nifty-Fifties on your right.) Turn right onto MacDade Boulevard, go through one light and look for Barnaby's and MacDade Plaza on your left. Turn left into MacDade Plaza and look for the clock tower in the shopping center - it's on your right as you enter the shopping center. From I-476: Take the Blue Route southbound to the MacDade Boulevard exit. Turn left at the end of the exit ramp onto MacDade Blvd (heading toward Philadelphia.) Go approximately 5 miles on MacDade Boulevard, looking for the intersection with Route 420. Once you pass 420, go through one more light and look for Barnaby's and MacDade Plaza on your left. Turn left into MacDade Plaza and look for the clock tower in the shopping center - it's on your right as you enter the shopping center.